Since July 2012 S+S Separation and Sorting Technology GmbH has a new trading partner with Sunnyvale in Sao Paolo, Brazil. S+S is one of the leading manufacturers of machines and systems for contaminant detection/separation and product inspection for food industry applications. Sunnyvale was established in 1978 and with its 130 employees focuses on the marketing of machinery for the packaging industry. Sunnyvale acts as an agency for more than 40 top-technology brands in the packaging sector, including all the well renowned companies in the fields of inspection and quality control and companies producing metal detectors, weighing machines, X-ray systems, labelling machines, and product inspection systems. With its prudent selection of international partners, its perfect knowledge of the market, and its sustainability in providing high-quality services, Sunnyvale has a leading position in Brazil's packaging industry. In line with its growth strategy S+S also wants to serve the booming BRIC markets that include Brazil. S+S was looking for well-established partners, and Sunnyvale has been distributing product inspection systems on the Brazilian market for more than 20 years. Says Xaver Auer, S+S Managing Director: "The partners of S+S must meet the high demands of our customers. Sunnyvale holds an excellent position and covers all the relevant regions in Brazil with sales offices and service. With its excellent know-how in product inspection and its well-developed sales network Sunnyvale is the ideal partner for the S+S "Food" business unit and will make it much easier for S+S to enter this new regional market." The cooperation between Sunnyvale and S+S as a supplier of metal detectors was officially announced at the FISPAL in July 2012 in Sao Paulo, and it was agreed to use a "Sunnyvale powered by S+S" co-branding. Contract handover between Sunnyvale and S+S representatives. S+S Separation and Sorting Technology GmbH of Schönberg, Bavaria, manufactures machines and systems for the detection/separation of contaminants, for product inspection, and for the sorting of material flows. Product sales primarily focus on the food, plastics, chemical, pharmaceutical, wood, textile, and recycling industries. S+S is one of the world’s leading suppliers with subsidiaries in Great Britain, France, China, Singapore, and in the USA, representative offices in India and Turkey, and more than 40 agencies all over the world. The S+S group presently has 350 employees, about 300 are working at the main factory in Schönberg. The consolidated turnover in 2011 amounted to approx. Euro 40 million. Reprints free of royalties. Photo attached. S+S Inspection Inc, the US subsidiary of the Bavarian company S+S Separation and Sorting Technology GmbH, has relocated its headquarters from Niagara, New York, to Bartlett, Illinois, near Chicago. Bartlett is about 20 minutes from O'Hare International Airport in Chicago. Relocation had become necessary because S+S intends to clearly expand its North America business operations. Comprehensive service for S+S customers in the USA mainly from the plastics, food, and recycling industries can thus be guaranteed. Relocation to the new headquarters in Bartlett was organised by S+S North America General Manager Werner Fleps. In addition to an extended design and manufacturing department S+S in Bartlett now also features a Customer Service Center that is equipped with a sorting line for customers from the recycling industry, and a full range of metal and contaminant detectors - from inductive through to X-ray - for customers from the plastics and food industries. The recycling demonstration line is equipped with proven sorting and separating systems and allows customers to perform realistic real-time tests. Machine settings are optimised to match customer-specific requirements. The Customer Service Center also guarantees the quickest possible delivery of new machines and spare parts to S+S customers, which is why machine and spare part stocks have been clearly increased. Werner Fleps: "If S+S intends to grow in the USA, closeness to our customers is of decisive importance. This means that we need a facility with a local technical center. For US customers Germany simply is too far away for obtaining information about equipment and technologies. To further back up our growth we also have strengthened our US team with Tracey Hartje and Tony Rampino." S+S Separation and Sorting Technology GmbH of Schönberg, Bavaria, manufactures machines and systems for the detection/separation of contaminants, for product inspection, and for the sorting of material flows. Product sales primarily focus on the food, plastics, chemical, pharmaceutical, wood, textile, and recycling industries. S+S is one of the world’s leading suppliers with subsidiaries in Great Britain, France, China, Singapore, and in the USA, representative offices in India and Turkey, and more than 40 agencies all over the world. The main factory in Schönberg presently employs 300 people. Turnover in 2010 amounted to Euro 30 million. At FAKUMA 2011 to be held in Friedrichshafen from 18 to 22 October 2011, S+S Separation and Sorting Technology GmbH, Hall B1, Stand 1302, will be exhibiting metal separators from the PROTECTOR family and EXRACTOR in line magnet systems for installation upstream of injection moulding machines for "Last-Chance" metal detection. The Extractor inline magnet was developed for plastics industry applications to protect extruders, injection and blow moulding machines. In previous versions the three neodymium magnetic rods were of 6000 Gauss strength at the effective surface, the external side of the stainless steel casings, where material contact takes place. S+S now has increased this power to 8000 Gauss with no increase in price whilst maintaining the same compact dimensions. Installed directly on the infeed, the Extractor separates ferromagnetic contaminations from the granulate immediately before processing reducing expensive repairs and machine downtime. The compact system design in combination with customer-specific connectors and adaptor plates can easily be retrofitted and will withstand dynamic loads up to 500 kg (shear loads up to 50 kg). The EASY CLEAN feature allows quick and efficient system cleaning. 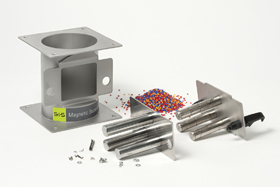 ATEX certified magnet separators are also available to meet stringent explosion protection requirements. The range of products on the stand is completed by metal detectors integrated into conveyor belts, and metal separators for vacuum and pressure conveyor lines. The use of recycled material is much more extensive than in the past and S+S is a leader in product sorting for plastics recycling. One of our expert staff will be available on the stand, Wednesday, 19 October 2011, to answer any questions on the subject of optical sorting by colour and polymer type. To make an appointment visit www.sesotec.de/termin_fakuma. 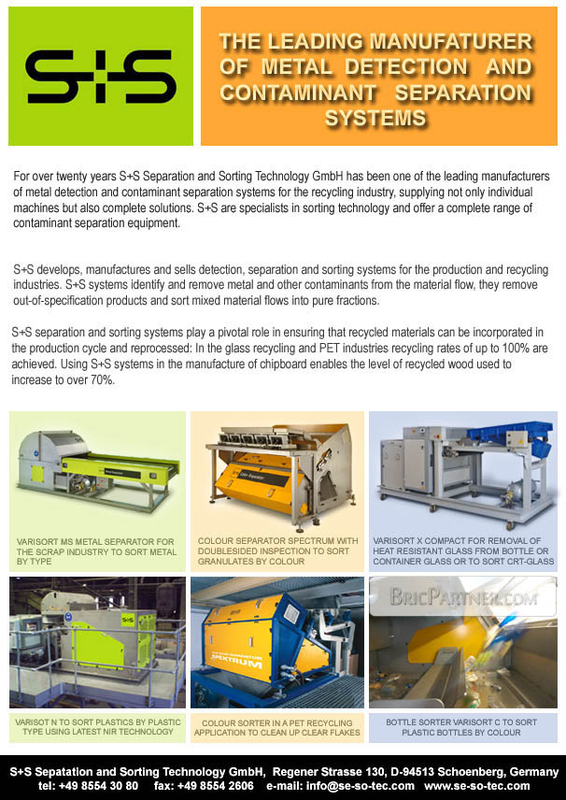 At the K 2010 plastics trade fair in hall 10, stand 10E60, S+S Separation and Sorting Technology GmbH presents comprehensive separation and sorting solutions for the complete life cycle of plastics. The systems that are presented comprise metal detectors and separators as well as magnet systems for all production stages and conveying types in plastics processing, and contaminant separators for plastics recycling. With the main subject of "All about PET" S+S here focuses on PET processing and recycling. All the systems presented at the trade fair are highly sophisticated solutions that represent the result of 30 years of experience. With the Protector-XHT S+S has successfully developed a metal separator in high-temperature version for processing temperatures of up to 200ºC. The separator is installed directly at the inlet of the injection-moulding machine or after the drier and thus inspects all the fed materials at the last chance control point. High-performance moulds, e.g. for bottle caps with up to 96 cavities (moulding nests) and more require metal separators with highest scanning sensitivity to protect the delicate hot-runner systems. For this application S+S has developed the Protector-HR metal separator. More than 80 percent of all the PET processing companies in Germany and more than 60 percent all over Europe use S+S separators for the reliable separation of contaminants. S+S sorting systems are ideal for PET flake sorting because they guarantee highest product quality that allows a further use of the recycled material in the food sector. Since quality requirements for recycled materials are high and such materials must be competitively priced against new materials, S+S sorting systems with their outstanding flexibility are a future-proof investment because they employ sophisticated technologies and provide high-purity material fractions. Superior technology of the VARISORT COMPACT combined system SchĂśnberg, July 2010 RecyPET AG was established in 1998 and has operated Europeâs first bottle-to-bottle PET recycling plant in Fraunfeld, Switzerland, since September 2000. The PET recycling plant operates in accordance with the URRC technology developed by the United Resource Recovery Corporation (USA) together with Coca-Cola and has an input capacity of approx. 18,000 tonnes per year. Four further plants in Europe now use this technology. RecyPET AG was established in 1998 and has operated Europe’s first bottle-to-bottle PET recycling plant in Fraunfeld, Switzerland, since September 2000. The PET recycling plant operates in accordance with the URRC technology developed by the United Resource Recovery Corporation (USA) together with Coca-Cola and has an input capacity of approx. 18,000 tonnes per year. Four further plants in Europe now use this technology. In Switzerland the collected beverage bottles are sorted in five sorting plants according to colour and quality, compressed into balls and delivered to RecyPET AG, among others, for processing. RecyPET’s goal is to close the material cycle for PET beverage bottles. The recyclate produced is used among other things for the production of new PET beverage bottles, food packing films, other films, etc. S+S Separation and Sorting Technology supplied a metal separator of the type PETMAG to RecyPET as long ago as 2001. The PETMAG separates metal contaminants of all kinds from PET flakes. Since the flakes are also to be sorted according to colour, S+S, in close cooperation with RecyPET, adapted a colour sorting machine originally used in the glass recycling industry to the requirements of PET recycling. The result was the SPECTRUM colour separator. By means of double-sided inspection it was possible even to separate flakes contaminated with the slightest glue residues. In 2010 the PETMAG metal separator, which during its ten years of operation caused service and spare part costs of barely 2000 Euros, was replaced by a combined system of the latest generation, the VARISORT COMPACT. Colour and metal sensors are combined with one another in this device. coefficients of friction, the belt feeding system provides for pinpoint ejection in free fall at the end of the belt, after the material has been classified with the sensors. After evaluation of the relevant information, high-speed valves for the material discharge are activated with an appropriate time delay. By means of powerful compressed air pulses, the particles to be separated are diverted from their original drop parabola into a separate shaft. In comparison to conventional belt sorting systems, the VARISORT COMPACT sorting system is characterised by a compact design requiring little space. Retrofitting in existing plants and the adoption of already existing chute devices is easily possible. The use of high-resolution sensors and state-of-the-art signal processing technologies allows high detection accuracy and the analysis of up to 500,000 parts per second. By means of the free-fall inspection, a very precise blow-out procedure can be realised even with high rejection rates. This is made possible by the large number of high-speed valves, which can perform up to 500 switching cycles per second. S+S Separation and Sorting Technology GmbH of Schönberg, Bavaria, manufactures machines and systems for the detection/separation of contaminants, for product inspection, and for the sorting of material flows. Product sales primarily focus on the food, plastics, chemical, pharmaceutical, wood, textile, and recycling industries. S+S is one of the world’s leading suppliers with subsidiaries in Great Britain, France, China, Singapore, and in the USA, a representative office in India, and more than 40 agencies all over the world. The main factory in Schönberg presently employs 230 people. All over Europe, electrical and electronic scrap is the waste stream showing the highest growth rates. Since electronic equipment contains the most varied kinds of materials, the recycling of such waste involves high demands with respect to separation and sorting processes. The German plant manufacturer MeWa builds state-of-the-art recycling plants for large international waste management companies. In the United Kingdom MeWa realised a plant where old refrigerators, computers, vacuum cleaners, Hi-Fi systems, and other kinds of electrical waste are processed on two separate lines. For the recycling of high-quality plastics such as ABS (acrylonitrile butadiene styrene) or PC (polycarbonate) and of printed circuit boards MeWa uses three VARISORT N sorting systems made by S+S. "The decision to use S+S systems was based on the high output quality of these VARISORT systems. Only absolutely pure fractions can be sold at a good price in today's difficult times", explains Peter Mayer, sales manager - sorting technology at S+S Separation and Sorting Technology. Polymer separators of type VARISORT N are based on near-infrared technology. At the MeWa facility these systems in fully automatic operation separate plastic types from precrushed electrical waste. Optimally scattered on a fast-running conveyor belt this waste reaches the detection area of the near-infrared detector which determines and locates the plastic types of the passing pieces. The electronic evaluation unit determines the exact position of the unwanted types, and with accurate timing and positioning activates the corresponding nozzles of the air-blast unit. The user can freely select which types of polymers should be separated. In one VARISORT sorting system the near-infrared sensor is combined with a colour sensor. With this multi-sensor system design the colour of the particle and its plastic type can be combined as sorting criteria, which results in an even higher separation accuracy for the pcb-fraction. S+S VARISORT N polymer separators are characterised by highest throughput capacities. Sorting is performed at a speed of up to 3m/sec. Air-blast valves that have been specifically developed for this application keep the loss of good material at an absolute minimum. In the recycling of electrical waste VARISORT N separators are an economically efficient solution for the reclaiming of high-quality plastic fractions and of the pcb-fraction. The resulting pure plastics can be profitably returned to the production cycle again, and valuable (precious) metals can subsequently be reclaimed from the separated printed circuit boards. Says Peter Mayer, sales manager - sorting technology at S+S: "Recycling companies that produce clean, economically-priced material have the biggest competitive advantage. Because of their outstanding flexibility VARISORT sorting systems are ideal for the sorting of electrical waste. No matter what type of electrical waste should be sorted in the current job, a VARISORT will always optimally perform the sorting task by employing different kinds of sensors. Since the markets for recycled materials are rapidly changing especially in the field of electrical waste, and since quality requirements for recycled materials are high, and recycled material has to compete with the price of new materials, the VARISORT sorting system with its flexibility is a future-proof investment here because the employed technologies are highly sophisticated and the systems provide high-purity material fractions." S+S Separation and Sorting Technology GmbH of Schönberg, Bavaria, manufactures machines and systems for the detection/separation of contaminants, for product inspection, and for the sorting of material flows. Product sales primarily focus on the food, plastics, chemical, pharmaceutical, wood, textile, and recycling industries. S+S is one of the world’s leading suppliers with subsidiaries in Great Britain, France, China, Singapore, and in the USA, a representative office in India, and more than 40 agencies all over the world. The main factory in Schönberg presently employs 200 people. Reprints free of royalties. Photos attached. S+S Separation and Sorting Technology has completely redesigned its well-known RAPID COMPACT metal separator. S+S Separation and Sorting Technology has completely redesigned its well-known RAPID COMPACT metal separator. The result is the RAPID VARIO PRIMUS which retains all the well proven features of its predecessor eg high scanning sensitivity. The PRIMUS control unit is a new feature. Another important improvement is the fundamental redesign of the separation mechanism which is infinitely adjustable up to 180°, depending on the customer’s requirement. Drop height can also be adapted to meet the customer’s specification as the detection unit and the reject mechanism are designed to be separated. The RAPID VARIO series is primarily used in the plastics industry however it can be used in other industries with similar applications for inspecting freefalling bulk materials. Even the smallest magnetic and non-magnetic metal contaminants are detected and removed from re-granulates and virgin material, thereby reducing machine downtimes and visibly and sustainably increasing productivity.